The most eastern island of the Canary Islands is Lanzarote. Like all the Canary Islands, Lanazarote owns it’s existence to volcanism. Craters and volcanoes dominate much of the island. With 824 square kilometers it isn’t very large and that fact, combined with the marvelous weather makes it ideal for a short holiday, especially after a long and cold winter. 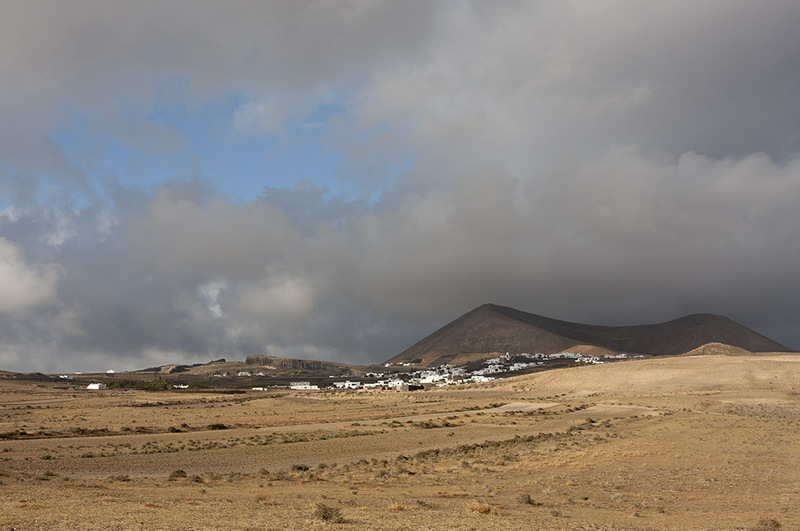 Lanzarote is called the ‘island of eternal spring’, so you can imagine what it feels like to step down from the plane after five months of cold and wet winter in the North of Europe. Due to its location only 110 kilometers away from the largest desert on earth, the climate and the vegetation of Lanzarote are arid. As a bird photographer don’t expect to see many species. But the species that are present are unique or at least rare in the rest of Europe. The arid climate demands special adaptation from the plants and animals that want to reside in it. It is ever so nice to leave from a misty, cold airport and arrive on a place where the sun is shining and with temperatures at levels I had almost forgotten existed. Only that feeling is worth a visit to the Canary Islands. With a rented Volkswagen Polo we arrived at Playa Blanca, at the southern tip of the island. Since I was on a trip with the entire family my time for photography was limited. Two early morning drives were all I could do in a one-week visit. Son when the rest of the family was still asleep I went off to ‘El Jable’ roughly the center of Lanzarote. Information on observado.org and on birdpix.nl revealed that the area there was most likely to offer success. While most of the island is covered with the black volcanic rocks and boulders, the ‘El Jable’-region is sandy, much like an arid steppe. 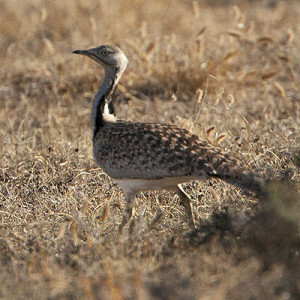 The sparse vegetation is the preferred habitat of the Houbara Bustard (Chlamydotes undulata spp. 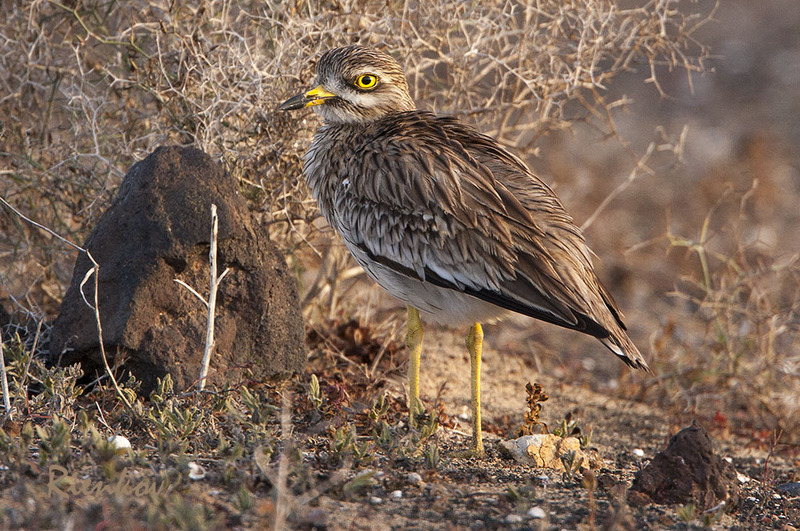 fuerteveturae), Stone Curlew (Burhinus oedicnemus) and Cream-colored Courser (Cursorius cursor), the species I was looking for. After a bright and sunshiny day, the next morning I left for ‘El Jable’, was quite cloudy. Not very promising if your aim is to take pictures. 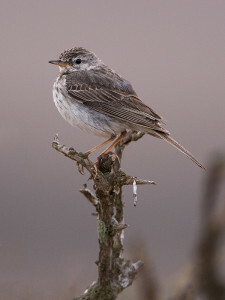 I drove along the dirt roads of ‘El Jable’ and only heard Berthelot’s pipits and some species of skylarks. Close to the outskirts of Tao I finally spotted a specimen on a short succulent shrub. It even allowed me to get close and take a few shots. At the same time the familiar cry of a shrike filled the air. A young bird landed on a boulder close to a farmhouse. Amazingly I managed to get to the car and drove a couple of meters to get close to the bird. This Southern Grey Shrike didn’t mind. After a few dozen shots it flew away. 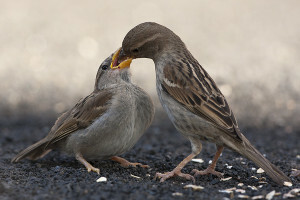 At that moment I was under the impression that all birds on Lanzarote where ‘easy’. Driving along the sand and dirt roads I could see local Nature conservation went to considerable efforts to maintain the (endangered) bird-population. On various places rows of grain where planted as additional source of food for birds. Numerous signs warned the visitor to stick to the roads and not leave the vehicle. But when I saw four Southern Grey Shrikes on a crucifix I broke the rule and left the car to crawl up the small hill to eternalize the scene in front of me. 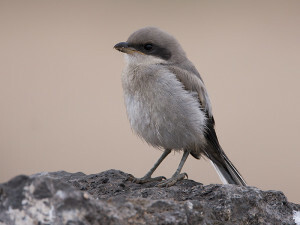 I pushed my luck a bit too much when two shrike’s choose to move to another view point a couple of hundred meters away. 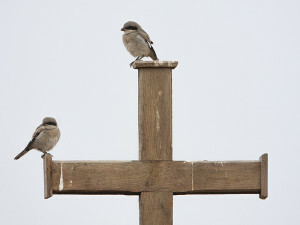 But, two birds on a crucifix is also nice don’t you think? The second morning I went to ‘El Jable’, the weather was a lot better than on the previous occasion. A few clouds, but mainly sunny weather made the situation pretty much ideal for photography. For some reason I spotted a lot more birds but no one wanted to pose in front of my camera. They all flew away long before I could get a good aim. But after some driving around I spotted two Stone Curlews flying away from me as I neared. It was again near Tao, pretty much at the same spot where is saw the Southern Grey Shrike a couple of days earlier. Fortunately the Stone Curlew’s didn’t go very far so with some luck and patience I more or less got close enough to obtain some shots. Stone Curlews are very well adapted to their environment. When they don’t move they more or less ‘dissolve’ in the background. When I scrutinized the area where the two observed Stone Curlews foraged I was able to find a total of thirteen individuals! When you take some time to observe these birds you get some insight in the behavior of this peculiar bird. On pictures the large yellow eyes of Stone Curlews give them a somewhat silly look. 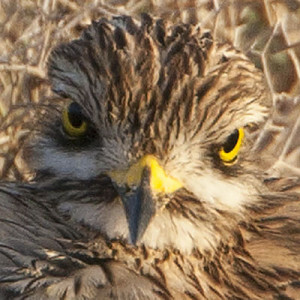 But when you look them straight into both eyes, the yellow irises resemble the stern look of a raptor! After some time I left the Stone Curlews to find a Houbara Bustard. After only a few minutes driving I spotted a specimen running away from the road, obviously not pleased with my presence even though I was still at least two hundred meters away! I got some shots as proof but whatever I tried I couldn’t get close enough for a decent shot. And only a few days ago I thought Lanzarote birds where easy. Like always, time is the crucial factor for successful bird pictures. Lanzarote is no exception. Invest lots of time and you can be successful. The birds I was looking for where spot on present where I expected them to be, so that shouldn’t be a problem. I had only a few mornings and was able to get some shots but neither of them will bring me the title of POTY. Light conditions are pretty good in February if you avoid the middle of the day and bright skies. Considering the time I was able to spend on bird photography I am quite pleased with the results. But I still want a decent shot of a Houbara Bustard and at least a glimpse of a Cream-colored Chaser. So I’ll probably go back some day in the future. February 2014 sounds would be nice.